DriForce works hard to ensure that our customers receive rapid response. We are an experienced environmental services company based in Metro Detroit. The expert restoration services we offer provide quick action in the event of an emergency or natural disaster. Our technicians and specialists are available 24 hours a day, all year round to provide you immediate services that meet your specific environmental service needs. Our industrial environmental services and commercial waste disposal experts take pride in promoting a safe and sustainable environment by following regulated procedures during a job. Our professionals understand the biology behind mold. We know where it grows, the causes for it and how to prevent it. Our experience and depth of knowledge helps us stop, contain and prevent the growth from spreading throughout your commercial business. Because of its consistency and resistance to heat once combined with other materials, asbestos was an efficient means of insulation. However, when airborne, these fibers can be carcinogenic if inhaled for a long period of time. Many structures built before the 1980’s contain asbestos and require removal. If you have questions regarding asbestos in your commercial building or need testing done, our environmental remediation professionals can help you. Deteriorating lead paint becomes hazardous once it begins chipping and mixing with the air. Once inhaled or consumed it can become poisonous. Avoid these effects by having your lead paint removed by certified, experienced environmental remediation professionals. Hazardous waste poses as a threat to both the public and the environment and if not properly disposed of, it can contaminate other areas. 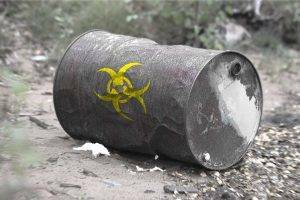 Once hazardous waste is generated, it must be properly contained, treated, transported and disposed of. The different classifications of hazardous waste require different disposal methods, so it’s vital that you contact experts with years of experience in hazardous waste management to properly and safely handle the disposal. Our trained specialists abide by state regulations when disposing of these environmental hazards. There is an abundance of environmental hazards that can cause serious issues to your health. Here at DriForce, we aim to protect the public and the environment by offering immediate and proven environmental services to eliminate these hazards. If you think you’re exposed to hazardous materials, protect your family, friends and coworkers by reporting it to our specialists so we can remove it. Call our environmental service specialists today at (877) 638-0081 or fill out our online form for a free estimate.